Maigret takes a cure in Vichy when the assassination of Hélène Lange takes place in the city. An inspector who worked formerly under Maigret, and became the police chief in Clermont-Ferrand, Lecoeur, directs the inquiry. Maigret shows some interest in the case and cannot resist to offer his assistance to Lecoeur. While continuing his cure and his walks with his wife he joins in the investigation. The personality of the victim intrigues the investigators. 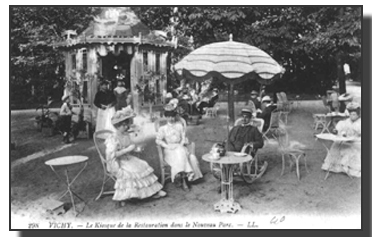 Originating from a modest family of the surroundings of La Rochelle (Marsilly), she has been employed in Paris, then lived as a woman of independent means in Nice and came to live in Vichy nine years ago. There are no strange or special connections or relationships in her life to be found. Yet they learn that she received, on more or less fixed dates, significant payments which she went to collect in the post offices of various cities. The interrogation of Francine Lange, the victim's sister, reveals that Hélène had a lover in Paris. However, immediately after the burial of Hélène, Francine hastily leaves the city to get back to La Rochelle where she directs a significant hairdresser's saloon. The investigators discover that she was frightened by a telephone call. All this leads to the arrest of an important business man, Louis Pélardeau. The interrogation of this man clarifies the case. Pélardeau was Hélène's Parisian lover. At In that period, Francine also worked in Paris, and had several affairs. When Francine became pregnant, Hélène announced to Pélardeau that she herself was with child. For reason of discretion the industrialist was to see his son only when he became of age. This explains the large sums touched by Hélène and the important hairdressers' shop of Francine. In Vichy where he takes a cure, Pélardeau finds Hélène and requires news about the boy. Having had no other children of his own, over the years, the child had become more and more important to him. Confronted with her refusal to reveal the whereabouts of his son, he got carried away by anger. He caught her by the throat and strangled her, without really wanting to kill her. He was unaware of what the police officers had to reveal to him: the child had died very young in a foster family in the country side where Hélène had housed him to be brought up. 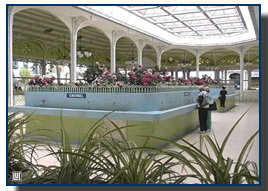 Vichy is situated in the central part of France, in the north of the "Massif Central". 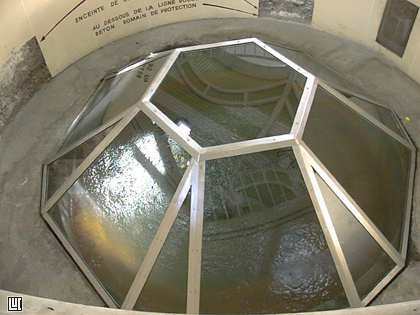 It is a town of 78.000 inhabitants in the Department of the Allier in the region Auvergne. The town is world-wide known for its therapeutic spa treatments and the hot water springs, of which the water is used for drinking cures. Vichy always was, and still is, strongly associated with health-tourism. There is a large number of hotels and restaurants, 2 casinos, a renowned opera house, a horse race-track, and countless health-, spa-, and fitness establishments. 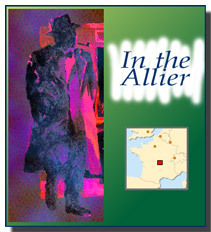 Maigret is sent to Vichy by his friend and physician Dr. Pardon because he is troubled by a indefinable feeling of weakness and unhealthiness. The therapies in Vichy are mainly orientated on rheumatism, metabolic problems and functional problems of the digestive system. The treatments prescribed by special thermal spa doctors can range from a simple drinking cure to an array of therapies with hydrotherapy, mud baths and massages. To-day French citizens can take a 18-day cure in Vichy refunded by social security. What makes the Vichy-waters so special? The spring water comes from deep under the earth's surface and absorbs on its way up an all gamut of minerals and substances. The water of each spring has a different mix of ingredients and a different temperature. These differences between minerals and dissolved substances and their proportions create a pallet of healing qualities that allows the doctors to obtain the most appropriate treatment for each patient. Maigret's thermal spa doctor Rian prescribes the police chief a drinking cure with the water of two springs - Source Chomel and Source Grande Grille - twice a day. Drinking the water of these therapeutic springs is not very pleasant.Their composition gives them a taste which makes their consumption more or less 'painful'. "Source Chomel (43.5°C - 110°F), the Chomel spring has choleretic and cholecystokinetic water. It is rich in fluorine. It is the most frequently used of the medicinal waters due to its perfect tolerance. In Maigret's time (1967) there where still young ladies helping the customers tap the water they needed. Since 1971 it has become "self-service". But the patients still carry their own measuring glass with them on their walks through town and to the Halles des Sources in the parc. In the novel Madame Maigret carries their glasses with her in a case of braided reed. - Cover of the French edition of "Maigret à Vichy", 1969, Presses de la Cité, Paris, France. 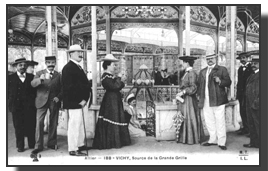 - Postcard of the Kiosk in the Parc de Sources in Vichy, Mediasys - Images de la France d'autrefois. 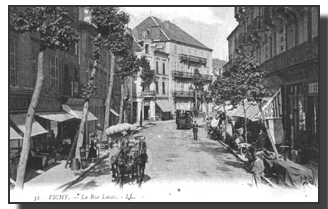 - Postcard of Rue Lucas in Vichy, Mediasys - Images de la France d'autrefois. 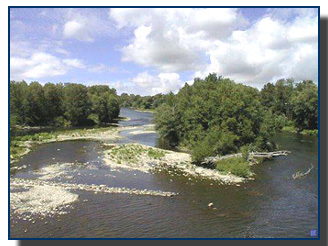 - Photo of the Allier river outside Vichy: Luc Chaumont from his website: Vichy-Guide. 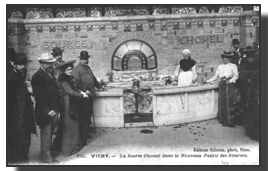 - Postcards of the source Chomel and Grande Grille in Vichy, Mediasys - Images de la France d'autrefois. 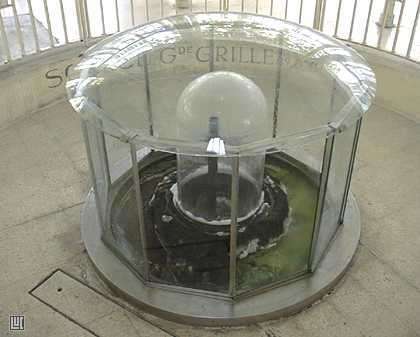 - Photos of the springs Chomel and Grande Grille to-day by: Luc Chaumont from his website: Vichy-Guide. 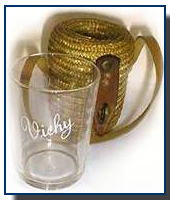 - Photo of the braided reed case to hold a measuring glass: Luc Chaumont from his website: Vichy-Guide. 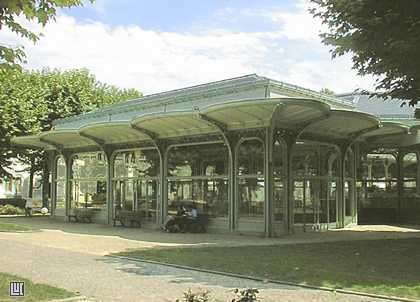 - Photos of the Halle des Sources, outside and inside, to-day by: Luc Chaumont from his website: Vichy-Guide. (1) Translation and compilation from: Maurice Piron, L'Univers de Simenon, Presses de la Cité, Paris, 1983, p.389. Translation of excerpt: G. de Croock.